Can P.E. be fun and educational? P.E. Teacher Sara Price reacts to the recent Wall Street Journal article "Taking the Dread out of Phys Ed"
P.E. teacher Sara Price (upper left) demonstrates basic moves. Sadly, it’s a story I have been hearing for years. As a lecturer in Health and Kinesiology at the University of Texas at San Antonio, and an adjunct professor at DePaul University, I have spent the past decade trying to convince the Physical Education majors who pass through my classes not to become one of those P.E. teachers. Even at Akiba-Schechter, I have spoken with parents who remember their P.E. classes with a distinct lack of fondness. My own P.E. experience as a student was not far from the one described in the Wall Street Journal’s September 13 article “Taking the Dread Out of Phys Ed,” and it’s almost a miracle that I became a P.E. teacher at all. In the article, Sue Shellenbarger describes the “fear of getting dressed in the locker room, of wearing a nerdy uniform, of looking clumsy, of being picked last.” In middle school I was not athletic, and our P.E. uniforms were polyester one-pieces that were green on the bottom and green and beige striped on top. It didn’t get nerdier than that. Then there was the running (I always came in close to last), and the long, boring, painful calisthenics we did every day. they understand why it’s important. To this end, we have devised a physical education curriculum at Akiba-Schechter that stresses skills development, and sport, games, and fitness concepts. We strive to provide variety and fun in all our activities. From an early age, we work with students to master basic skills such as throwing, catching, skipping, galloping, hula hooping, jumping rope, kicking, and trapping. These skills form the building blocks for more complex sports that children begin learning in third grade. This year, for example, students have begun learning tennis ground strokes, volleying and serving, tennis rules, and the scoring system. We spend four weeks, or eight days, on each unit, mastering basic sport skills through drills, lead-up games, and finally, competitive games. When students feel that they have mastered the skills, they are better able to enjoy playing the games. We also strive to educate our students physically. 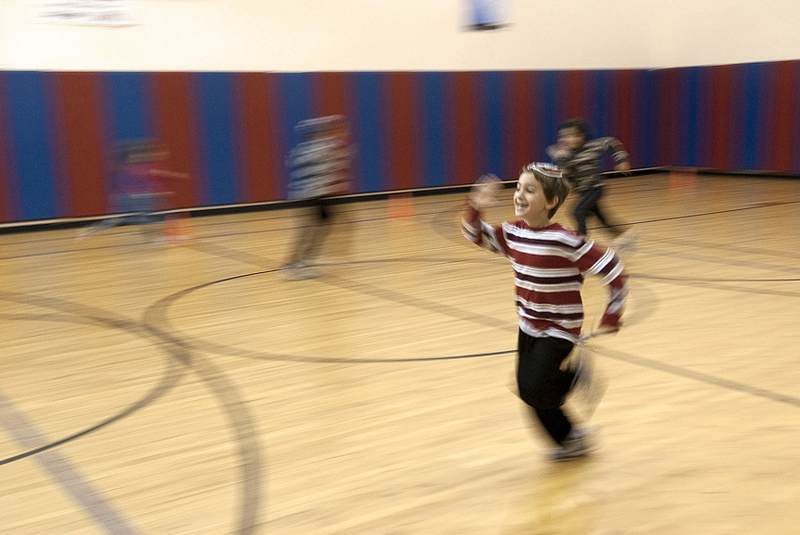 We still run laps from time-to-time, but it is one of many ways we warm up for an activity. We still do calisthenics, but we try to be more creative, make them more engaging, and we teach them in a sport-specific capacity. We learn what muscles they engage, and why it is important to engage them. 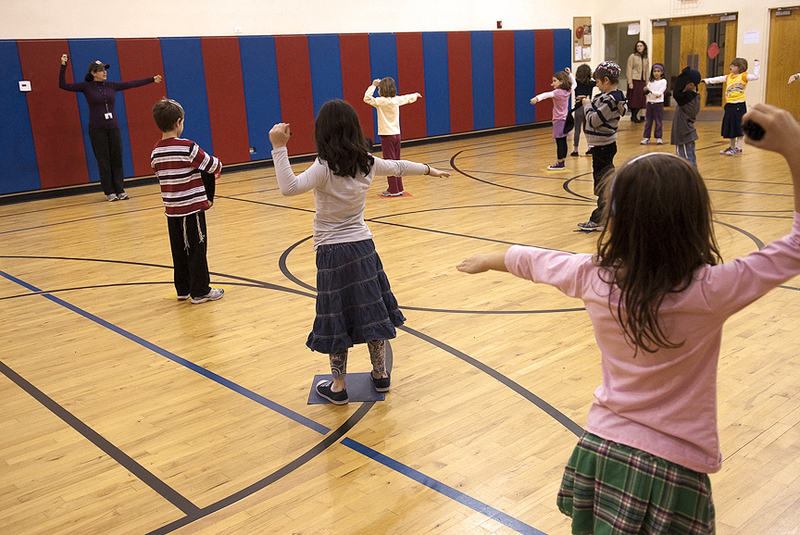 Akiba-Schechter students learn about aerobic fitness, and why it is important to strengthen their hearts as well as their core muscles, arms, and legs. Students learn not only to play sports, but a little about the sports as well. They learn whether it is an Olympic sport or not, where it originated, and where it is popular. And they learn enough of the rules and strategies to be informed players and spectators. Finally, P.E. has to be fun! Most classes begin with a warm up game, followed by a fun fitness activity. Lessons are designed to maximize activity time (you will rarely, if ever, see a long line of students waiting for their turn), minimize repetitive activities (you won’t see them doing countless trials of any drill), and increase skill level and confidence. 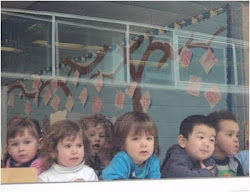 We try to create a positive and safe environment for each child. Sportsmanship and teamwork are stressed over competition and winning. Children learn to interact positively and encourage each other. Cooperation precedes competition, and when children do compete, it is always in a controlled, fair manner. 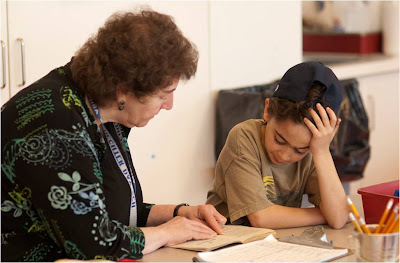 At Akiba-Schechter, we have thoughtfully and purposefully designed a physical education curriculum to give our students the tools to participate in sports and recreational activities, and to instill the love to pursue them for a lifetime. Principal Miriam Schiller reads with a student. Pre-School Director Carla Goldberg (center) sings with the parent/tot class. And that’s what it’s all about: each and every child.